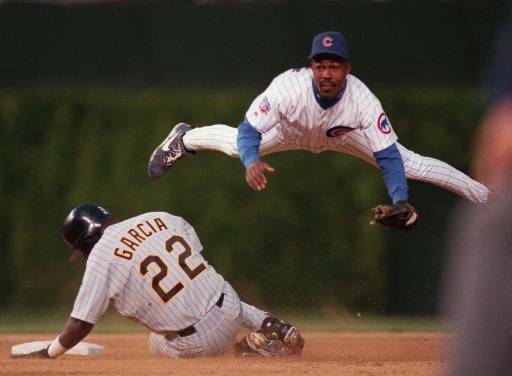 He hasn’t played for the Cubs since 1997, but Shawon Dunston was, and still, is a fan favorite. He had a cannon for an arm; it was sometimes erratic, but he hustled on every play. Now he is a special instructor for the San Francisco Giants but he still loves coming to Wrigley Field, a place that was very special to him. I caught up with Dunston on a recent trip to Chicago. As a 22-year-old, this shortstop phenom was brought up to play for the Cubs in 1985; he struggled and was sent down to the minors. That experience humbled him and he returned after six weeks more mentally ready. Dunston relied on the team veterans like Rick Sutcliffe, Jody Davis and Andre Dawson to guide him. He needed the skills of his first baseman, Leon Durham, and Mark Grace him to save defensively. He loved playing for the fans since it was a full house no matter where they were in the standings. If there is one thing Shawon Dunston is distinctly remembered for, it was something a fan did for him in 1989. He was originally perplexed by it, but learned to embrace it — the “Shawon-O-Meter.” It was a man-made sign that had his batting average — .177. At first he thought it was to insult him. But the fan did it because he wanted to bring him luck, and it did. As his batting average increased, his popularity rose, like that of his teammates, Ryne Sandberg and Jody Davis. The sign became a big deal with Cubs broadcaster Harry Carey; now there&apos;s one in the Baseball Hall of Fame, another in the Smithsonian and a third in the Chicago History Museum. Hall of Famer Andre Dawson kidded his former teammate that at least his sign made it into the Hall — even if Dunston would not get there himself. Dunston looked like he would be a Hall of Famer; in fact he was the number one draft pick overall in 1982. He was having a solid career, but he injured his back picking up his daughter in 1992, and it cost him two years of playing time. Dunston believes that if he hadn’t been injured he would have remained a Cub his whole career. Instead he bounced around playing for the Giants, Cardinals, Pirates and Indians. In his early playing days at Clark and Addison, Dunston watched for his wife and daughters arriving in the stands. As he sat in the dugout with me, I could tell that memory is still as vivid as when he played. Only now, it&apos;s important than ever — it may be him sitting in those stands to see his son in a few years. Dunston Sr. says if his son makes it to Wrigley, he and his wife, Tracie, will be there — and he expects to shed a few tears. But he knows the Cubs fans he loves so dearly will embrace his son, as long as he plays hard as hard as his dad did.